The jerseys are being donned by the Colts players this week at the Indiana Farm Bureau Football Center and with another phase of OTAs marks one step closer to the begin of the 2013 regular season. Pete Prisco from CBS Sports has come out with a version of the 2013 Power Rankings and the Colts come in at the No. 12 spot, a far cry from where many pundits had them at this time last season. They shocked a lot of people last year, and Andrew Luck will be better, but the schedule is tougher too. Do they have a step-back season? The Colts 2013 rookie class isn’t a month into their new city but they are slowly being ingrained to what Indianapolis is all about. With some extra planning from Director of Player Engagement David Thornton, the Colts rookies had a weekend that many Hoosiers would dream of in visiting two iconic images in the state capitol. “It’s absolutely amazing,” kicker Brandon McManus said while standing in the IMS pagoda looking over the straightaway. Stormy weather on Friday afternoon didn’t damper any of the rookies spirits as the awe of being inside the world’s largest stadium quickly set in. Indianapolis Mayor Greg Ballard welcomed the rookies to the Speedway and gave the class a short speech on the magnitude of an impact they will have on the Circle City. Next on the agenda was a trip down to the social media center where the players interacted with fans and took their turn at an IndyCar simulator. The trip did not end without the players heading down to the car garages where they toured various team garages. Next, was a chance to step foot on the track where the rookies kissed the historic yard of bricks before a few hopped inside of an impala and were driven around the 2.5 mile oval. For nearly every member of the rookie class, it was the first time that any of them had been to a race track. 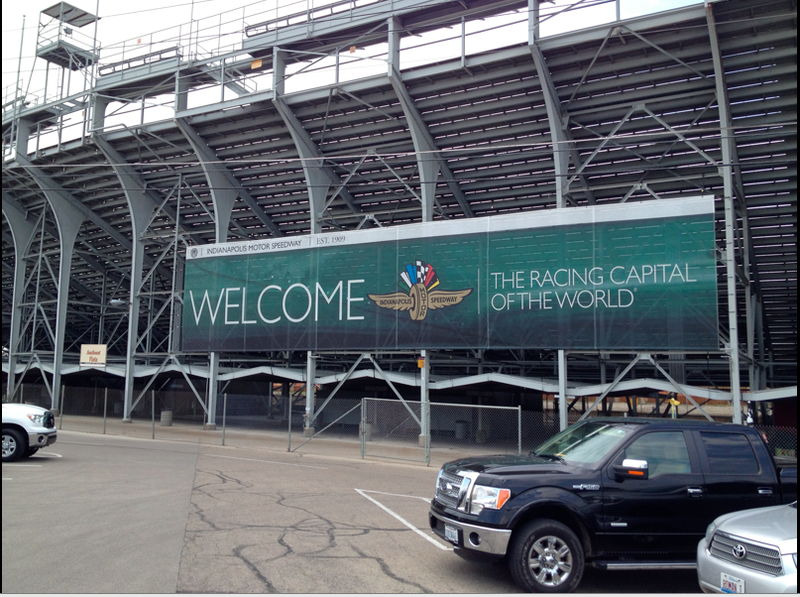 A few will be back on Sunday to experience the 97th running of the Indianapolis 500. This past weekend’s visit to IMS was followed up with a trip to Bankers Life Fieldhouse for the Pacers clinching Game 6 victory which made for an exciting first weekend away from football for the 2013 Colts rookies. “It’s real nice because you have a bunch of guys from all over the country and from outside the country like Bjoern (Werner),” offensive guard Hugh Thornton said. 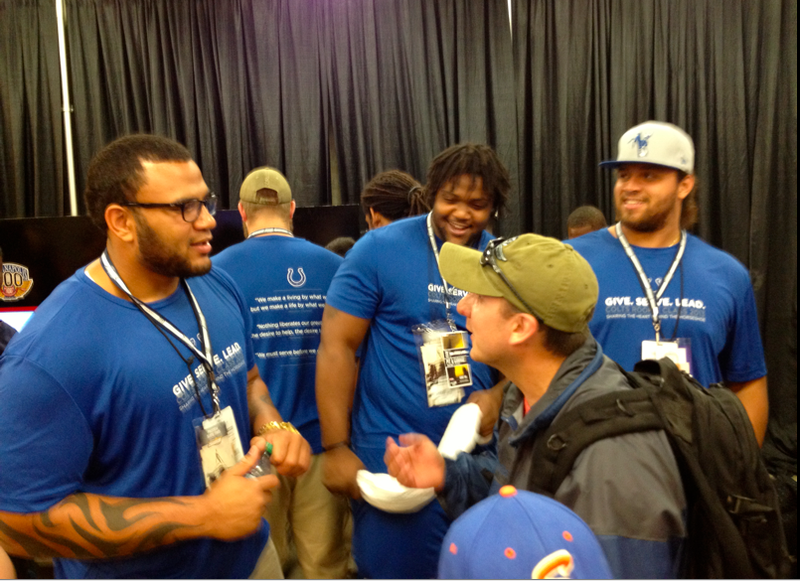 Colts draft picks Hugh Thornton, Montori Hughes and Khaled Holmes meet fans inside the Indianapolis Motor Speedway. After the Colts rookies got to experience the Indianapolis Motor Speedway on Friday afternoon, their head coach followed suit on Saturday. Chuck Pagano took in one of the most iconic stadiums in all of sports and was even able to ride around the historic track with Mario Andretti. It might be the offseason, but King’s Monday Morning Quarterbacks is still a must read. In this week’s entry he takes a look at New England Patriots quarterback Tom Brady and the comment the All-Pro signal caller made which will surely make a few heads turn around the NFL. As far as Colts fans go, the good news is the Patriots and Colts aren’t on the schedule for the first time since the 2002 season. IS A BIG A WIDE RECEIVER NEXT IN LINE FOR THE COLTS? The names and stories are all over the Colts locker room. There’s Jerrell Freeman who turned three years in the Canadian Football League into setting a Colts season record in tackles last season. Further down the wall of lockers is Justin Hickman who’s roots also extend into the CFL. Jeremy Kelley knows those names and Ryan Grigson’s pedigree for exploring all options in completing a full roster was something that intrigued the 6-6, 225-pound wide receiver to sign with the Colts. “Once I get here, I find out that there’s a couple of more guys that were under the radar type guys that took the road less traveled,” Kelley said. With the frame of a slender tight end, Kelley brings something to the receiver position that hasn’t been seen in Indianapolis. The Colts receiving corps is filled with electric, jitter-bug type targets and Kelley feels he brings a dimension that can only add to the diversity of the group. “That’s what I kept hearing when I came out here–Indy’s never had big wideouts,” Kelley said. Kelley, who has spent the last two seasons in the Arena Football League following a stint in the CFL, participated in the Colts rookie minicamp from May 10-12. When the first rookie minicamp practice concluded, there was the thump of the jugs machine running near midfield as Kelley was the lone member to stay after for extra reps. The following day, there was Kelley again the lone rookie in the Colts locker room with iPad in hand, dissecting a playbook he hopes to still be in come September. “It’s necessary, especially a guy in my position, being a free agent coming out of Arena, Canadian leagues and what not,” Kelley said of the extra work. The Last Word with the Colts returns this week to discuss how the Pacers can bounce back and close out the Knicks in Game 6 tomorrow night. The boys – Matt Taylor, Jimmy Matis and Bob Lamey – also have a friendly chat about which drivers have the best chance to take the pole at the Indianapolis Motor Speedway tomorrow. Guests Ryan Grigson, Helio Castroneves and Scott Goodyear stop by as well! LIVE CHAT FRIDAY AT 11 A.M. This Friday, I will host a one-hour chat called “Horseshoe Roundup” beginning at 11 a.m. During the offseason, the chat will take place every two weeks and it will move to a weekly schedule once the regular season gets closer. For this week, OTAs are in full swing and the Colts rookie minicamp took place this past weekend. What questions do you have about the Colts 2013 rookie class? What are your impressions of this team with a 90-man roster in place and training camp just two months out? We will concentrate on these topics but whatever questions you have, I will try and address in the course of an hour. Also, I sat in on Chuck Pagano’s conference call with season ticket holders on Wednesday night and I will share some of the head coach’s thoughts during our chat. The CBS Sports story that ranks Irsay as the league’s 2nd best owner broke earlier in the week but Chappell offered his own thoughts via his blog. Chappell is one of the longest tenured beat writers on any NFL team so he has great perspective when these debates arise. Along with commenting on the Irsay ranking, Chappell points out another CBS poll that left off the Colts personnel department among the league’s top ten front offices. Ask virtually any Indiana native and it’s almost a right of initiation for a Hoosier to at least make one visit to the Indianapolis Motor Speedway during the month of May. Andrew Luck has called Indianapolis home for just over a year and he accomplished that visit on Wednesday afternoon. Driver Charlie Kimball hosted Luck, Chandler Harnish, Matt Hasselbeck and Griff Whalen as the four players got to tour the No. 83 Novo Nordisk Chip Ganassi Racing garage. Busy with school last May, Luck made sure to make it out to the speedway this year and his relationship with Kimball extends back to the IU-Riley event the driver attended with the Colts quarterback. Kimball’s father is a Stanford alumnus and Charlie’s aunt even spoke to Luck’s freshman English literature class in Palo Alto. Both Luck and Kimball spent part of their childhood growing up in Europe but now it’s all about the Circle City during the month of the May. “I wanted them to come see my office, because in the Winter, it’s easy to turn on the TV and see these guys go to work on Sundays,” Kimball said. Looking to spend a day with Colts punter Pat McAfee with a chance to win various Colts prizes, including tickets and a signed Andrew Luck helmet. Well then you’ve come to the right place as Pools of Fun in Noblesville will host McAfee for an autograph session on Saturday, May 18th. *Colts elements arrive at noon with Pat McAfee signing autographs from 2:00 – 3:00 p.m.
All proceeds from the raffle benefit the Susan G. Komen Foundation.